Everyone should visit Boston at least once, preferably in the Autumn when the tree lined avenues and parks are starting to turn from green to copper. Boston is a city of great political and historical significance, however, it is better known as the home of Harvard University, The Red Sox and not forgetting the “Cheers” bar. In recent weeks a bench in the Public Garden, made famous by the “Your move, chief” scene from the film “Good Will Hunting” has become a memorial to the late Robin Williams. Getting to Boston is very straightforward, Virgin Atlantic fly directly to Boston Logan International from Heathrow in around seven and a half hours at a cost of just under £500. A more interesting way to reach the city is by train from Penn Station New York as these are two great cities to visit on the same trip. Amtrak offer a regular service that takes up to five hours with the majority of the journey taking in the stunning coastal route, however, the Acela Express is a more expensive option, it follows the same route in a little more luxury and takes three and a half hours. Either way, using Amtrak is the best way to see the country and some may argue that New England is so picturesque that it is a shame to miss it by flying in direct. Boston is made up of several districts and unlike other US cities ( e.g. New York or Chicago) it does not follow a simple grid system. It is actually quite like England and the winding streets can be quite confusing. The underground works well, but a really good way to travel around is by bike. In my opinion, taxis are to be avoided as they are very expensive. 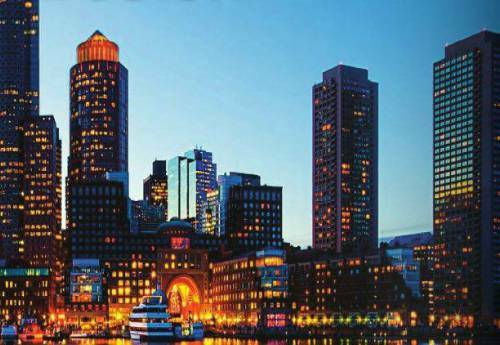 In Boston there are several visitor schemes on offer and it is worth buying a "Boston CityPASS" or "GoBoston"card for discounts and free admission to certain attractions. The city is full of museums and galleries, but if you had to pick just a few my favourites are the Harvard Art Museum for up and coming talent and The Harvard Natural History Museum where the "glass flowers" collection is always very popular. The New England Aquarium is well worth a visit and houses one of the largest fish tanks in the world. Boston Common and Public Gardens form one of the oldest parks in America. In the summer months the gardens are full of visitors and street vendors enjoying this great open space. The swan boats are available for hire throughout the year and a short walk away on Beacon Street is the "Cheers" bar which is always very popular with tourists. Copely Square is centrally located to go shopping along the fashionable Newbury Street full of high end boutiques or to visit the observation level of The Prudential Tower. The Prudential Center is the perfect way to see a panoramic view of Boston and the Skywalk is a very popular attraction. Copely Square is one of the points where you are able to join a "Duck ?Tour" which remains one of the most fun ways to see the city. The Freedom Trail is the place to learn about the America Revolution as it all started in Boston where a shadow government was formed to prepare for war against the British troops. This trail is two and a half miles long and if you join one of the guided tours it is the best way to have a really interactive history experience. For a little more history, visit the USS Constitution that resides in the harbour. Built as one of the first ships of the US Navy, she is the oldest commissioned naval ship still afloat after over 200 years. Boston is very much a sports town, with the baseball team the "Boston Red Sox" being one of the most famous in the USA. Fenway Park is the home of the team and one of the oldest stadiums still used for competitive baseball. Tours are available daily, but the best way to experience this venue is to attend a game. Matches are often a sell-out so it is worth booking tickets early. Do not forget to enjoy the benefits of a coastal city! Revere beach is two miles long and can be reached from central Boston for less than $10. The beach retains many Victorian features, including bathing houses for those who prefer to keep out of the midday sun. A few miles off the coast is the island of Martha's Vineyard which can be visited in a day trip and on George's Island a tour of the former Fort Warren is highly recommended. If visiting in October, the main event of the social calendar is The Head of The Charles Regatta. This is one of the world's largest rowing events and lasts for two days attracting rowers from all over the world. Spectators line the banks of the Charles River, which under normal circumstances is the perfect place to learn to sail, kayak or canoe. The Boston Harbor Hotel is certainly one of the friendliest hotels that I have ever stayed in and my pick of the Boston Hotels. As it's name suggests it is located overlooking the water at Rowes Wharf and is around a fifteen minute walk to the common. The service is excellent throughout and the hotel is decorated in a classically luxurious style, very much in keeping with what you would expect from a top New England hotel. Despite having 230 guest rooms and suites, the staff are incredibly attentive. They always remembered my name and definitely went the "extra mile" to secure some baseball tickets for me during my stay. Within the hotel there is a fine dining restaurant serving fantastic New England lobster and a selection of fresh fish caught that day.. When returning to Boston, I can not imagine staying anywhere else. Atlantic Fish Company is the go-to restaurant for seafood. The restaurant is always busy and with tables closely packed in, this is not somewhere for an intimate meal for two! The food, however, is divine. Fresh lobster ravioli, crispy calamari and the home made crab cakes are all highlights, not forgetting a platter of oysters to start. Great puddings too, if you are still hungry. The Flour Bakery and Cafe is the pick of the bunch for breakfasts, coffees and light lunches. Their sticky buns are rather famous and the bakery tends to have sold out by late morning. Sandwiches are made with fresh ingredients and homemade relishes and condiments. There are also muffins and other treats made without gluten so it is no surprise that the cafe is packed and the queue is long! If visiting the common or taking a day trip to one of the islands this is a perfect place to stock up on picnic essentials. Sorellina is the reservation to make for a romantic dinner. Serving American/ Italian food that is consistently excellent, the menu has been paired with well chosen wines. The restaurant is stylish with white linen and neutral tones, the main event is certainly the food. Beef carpaccio and the gnocchi with lobster come highly recommended, and although rather uncouth, order a side dish of truffle fries with parmesan cheese. The best cheesy chips you will ever taste! It's expensive, but it is very good. Book well in advance and arrive in plenty of time to enjoy a cocktail at the bar. Pizza Regina is now something of a Boston institution and some consider the finest pizza parlour on the East Coast. The restaurant is basic, always busy and be prepared to join the queue that goes almost around the block. They claim to have perfected the Margarita pizza and I would not disagree. The huge pizzas can also be bought by the slice so there is something to suit every appetite!